Blinkers will go Bold Arial for the first time when the filly steps out in the Group 3 $150,000 Widden Stakes (1100m) at Rosehill on Saturday. Secret Lady, above, is well in contention in the Widden Stakes at Rosehill. Photo by Steve Hart. The Gai Waterhouse and Adrian Bot trained Bold Arial has only been to the races on one occasion for a tenth to Satin Slipper in the Listed $150,000 Keeneland Gimcrack Stakes (1000m) at Randwick at the start of the two year old sesaon back in September. The I Am Invincible filly has pleased the stable with a handy second in a recent barrier trial over 900m at Rosehill on January 22 and the stable has reported that she has shown improvement in her work since. “Bold Arial has done very well since her trial and her final gallop on this week was eye catching work,” Waterhouse wrote on her stable website. 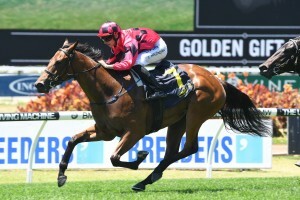 Bold Arial has drawn in close at barrier two with Adam Hyeronimus to ride and is well in contention in the betting for the Widden Stakes at $6 with Ladbrokes.com.au. The Chris Waller trained Fiesta sits at the top of the market order at $3.20 ahead of Gary Portelli’s Secret Lady at $6 and Into The Abyss at $7.50. Fiesta is also wearing the blinkers for the first time and has had a solid preparation for her return to the race track with two recent 900m Rosehill barrier trials for a second and a win. Fiesta has the experience of two race starts during the 2017 Spring Carnival for a third in the Gimcrack Stakes and a second in the $100,000 Kirkham Plate (1000m) at Randwick. Kerrin McEvoy takes the reins on Fiesta who has drawn nicely at barrier four in the thirteen horse Widden Stakes field.